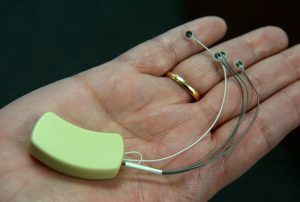 The BRIDGE device had three sensors that send a message to the brain to stop it from feeling pain. CHARLESTON, W.Va. — Daniel Tucker, 26, said he can’t remember how many times he tried to quit opioids, but now he’s on his longest stretch of sobriety. He credits part of his success to a device small enough to fit in the palm of his hand and looks like a hearing aid. It’s called BRIDGE and Saint Francis Hospital’s Addiction Healing Center is the first place in West Virginia to use it. It has sensors placed in and behind the patient’s ear. The device sends a frequency to the brain that stops it from feeling pain.